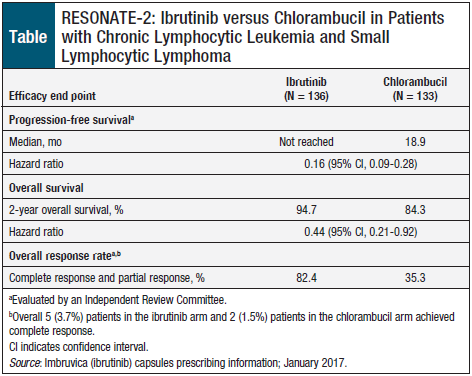 On January 19, 2017, ibrutinib became the first nonchemotherapy ever to receive FDA approval specifically for the treatment of patients with relapsed or refractory marginal zone lymphoma who require systemic therapy and who have received at least 1 previous anti-CD20–based therapy.13 The FDA used its accelerated review process for this approval. 13. AbbVie. U.S. FDA approves Imbruvica (ibrutinib) as first treatment specifically indicated for relapsed/refractory marginal zone lymphoma (MZL)-a rare type of non-Hodgkin’s lymphoma. Press release. January 19, 2017. https://news.abbvie.com/news/us-fda-approves-imbruvica-ibrutinib-as-first-treatment-specifically-indicated-for-relapsedrefractory-marginal-zone-lymphoma-mzl-rare-type-non-hodgkins-lymphoma.htm. Accessed March 1, 2017.